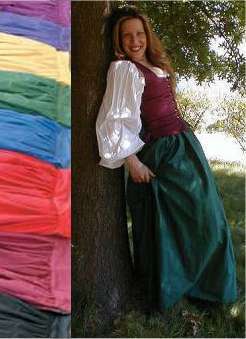 The gathered skirts are made of soft cotton that mimicks the weave of linen without the expense. A double set of lace holes in the back of the waistband allows for adjusting the fit should you lose or gain weight. The extra-high waistband is superior to elastic waistbands because it helps to keep the chemise or partlet tucked in all day. You'll never look disheveled.